Jen Psaki stumbles when asked about Kerry’s remarks that Israel risks becoming an "apartheid state". U.S. Secretary of State John Kerry’s comments that Israel will become an "apartheid state" if a peace agreement is not reached with the Palestinian Authority (PA) have been met with outrage, and his spokeswoman had trouble explaining them on Monday. 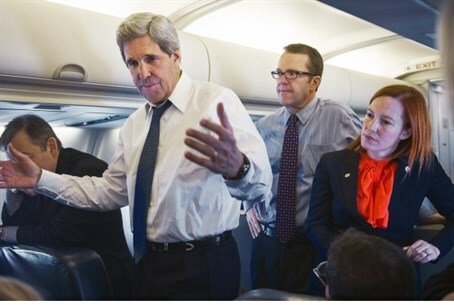 The Washington Free Beacon noted that State Department spokeswoman, Jen Psaki, stumbled when asked to acknowledge the offensiveness of Kerry’s remarks. All Psaki could come up with to justify the statement was that it was part of Kerry’s support for the “two-state solution” and that “many officials have used similar phrases”. “I think his meaning of any comments he makes is his support for a two-state solution and his belief that it’s hard to see how the parties can prosper without it,” she said when asked about Kerry’s comments by Associated Press reporter Matt Lee. When Lee pressed her on the comments, asking if any other American officials had used such a loaded term during a negotiation, Psaki replied, “Well, Matt, he certainly didn’t say ‘is,’”. “You’re saying that the secretary does not believe that. Can I ask you why he does not share the views of those pro-Palestinians?” asked Lee. “Because he believes that Israel is a vibrant democracy with equal rights for its citizens,” Psaki replied. Lee kept on, asking if the State Department understood that not every person living under Israeli authority is an Israeli citizen and that, since many Palestinian Arab people view Israel as being similar to an “apartheid” state, whether Kerry realized he’d angered two groups of people simultaneously. The Daily Beast website first reported about Kerry’s comments on Sunday. The remarks were made during a closed-door meeting, and the website received a recording of them. In addition to the apartheid statement, Kerry also suggested that a change in either the Israeli or Palestinian leadership could make achieving a peace deal more feasible, and lashed out against Israeli construction in Judea and Samaria. Kerry also said, according to The Daily Beast, that both Israeli and PA leaders share the blame for the current impasse in the talks. Transportation Minister Yisrael Katz (Likud) sharply criticized Kerry’s comments on Monday, connecting them to Holocaust Memorial Day. "Holocaust Day ceremonies. [We hear] terrible descriptions [of] how the Nazis and their collaborators, drenched in hate and race theory, turned millions of defenseless Jews into dust and ashes - and the world stood by in silence," Katz wrote, in a Facebook post. "And now the Secretary of State describes Israel as an 'apartheid state,'" Katz lamented. "Us? The Jewish state, [which was] established to protect itself after [it was] intimidated with threats of extermination?" "Kerry, shame on you!" he concluded. "There are things you just can't say." Katz was preceded by Dani Dayan, Chief Foreign Envoy of the Council of Judea and Samaria, who also slammed Kerry over the remarks. Dayan said that Kerry's comments smacked of blackmail – that Israel would be blamed for any failure of the talks.